A group of parents, grandparents and supporters have been protesting for a Family Court judge to be removed from the bench after allegations of due process violations surfaced this year. 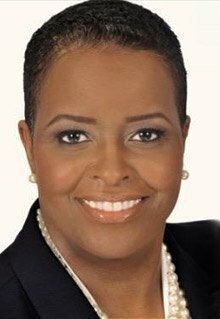 In November 2015, Lyris F. Younge was elected to serve as a Philadelphia Court of Common Pleas judge. Two weeks ago – just two years and seven months later – the president judge of that court petitioned for Younge to be permanently reassigned from the Family Court bench on which she’d served. There, her controversial – albeit short – tenure reportedly devastated Philadelphia families, mystified and infuriated attorneys, and called into question the virtue of electing judges in the city. “Your petitioner deems this reassignment necessary and in the interest of the effective administration of the business of the Court,” wrote Sheila Woods-Skipper, president judge of Common Pleas court in a June 11 petition to the state Supreme Court. Court officials said they’re letting that line in the petition serve as their comment on the matter. But it doesn’t come close to describing the astonishing totality of what people say they faced in Younge’s courtroom. Parents claimed their children were taken away from them before they even had the opportunity to address Younge's court or present evidence to answer claims being made against them. Family Court operates in a fashion somewhat shielded from the public eye. That’s guided by the sense that issues involving children should face a lower level of public attention than those facing adults at the Criminal Justice Center. As a result, it took more than a dozen people who’d seen their children taken away from them to speak up – and diligent investigative reporting by the Legal Intelligencer’s P.J. D’Annunzio – to draw attention to a situation that, if the claims are true, brings a different version of the family-separation issue home to Philadelphia. Samuel Stretton, the attorney representing Younge, did not return a call seeking comment for this story last week. In the wake of the decision to transfer his client to the court's Trial Division though, he told the Philadelphia Tribune that "I believe she is being unfairly accused. She is a fair judge and I don't know why they are going after her." Several people on the other side of the issue, however, told PhillyVoice this week that they see the move as a saving grace. Two of them are parents who saw their children taken away from them under questionable circumstances. The third is a longtime Philadelphia attorney who witnessed firsthand how Younge operated during a case involving his daughter and son-in-law. It’s their chance to push back against a judge who they say acted more like a tyrant than a fair-minded jurist charged with oversight of Philadelphia families in the legal system for a variety of reasons. Their reversal of fortunes, one that they didn't think would ever come, started fewer than three months ago. “Phila. Family Court Judge Has A History of Violating Parents’ Rights” read the headline of an April 2 story in the Legal Intelligencer. The protesters have gone to Family Court with their message. She was barred from re-entering a courtroom to testify before Younge ordered her child taken from the home and placed into foster care. That move drew a rebuke from an appeals court panel warning Younge to be “faithful to the law,” which having “precluded (the mother) from the opportunity to be heard” was not. It also found that decisions made by Younge – who received a “not recommended” rating from the Philadelphia Bar Association prior to the election – faced “more active appeals … (and) more rulings fully or partially overturned on appeal” than her peers. One “veteran family lawyer who practices before Younge” was quoted in the piece. D’Annunzio's story opened the proverbial floodgates, prompting parents who’d faced similar situations in Younge’s courtroom to find one another and share their stories. Younge would soon be pulled from the contempt case against an attorney she’d never given the chance to defend himself. In May, an appeals court ripped Younge for doing “everything in her power” to take an infant away from her parents and placing her in foster care, instead of with her grandmother, in an attempt to make the parents confess to alleged abuse. It represented the ninth time that one of Younge’s decisions was overturned on appeal, according to the Intelligencer's investigation. That same month, the state Judicial Conduct Board launched a probe into the judge’s track record of alleged due-process violations. Stretton, the attorney hired by Younge, told the Intelligencer that the investigation was sparked by the coverage and subsequent publicity. He also maintained that his client is doing “an incredible job with an extremely difficult caseload,” and rued the lack of support coming from the court’s administration. 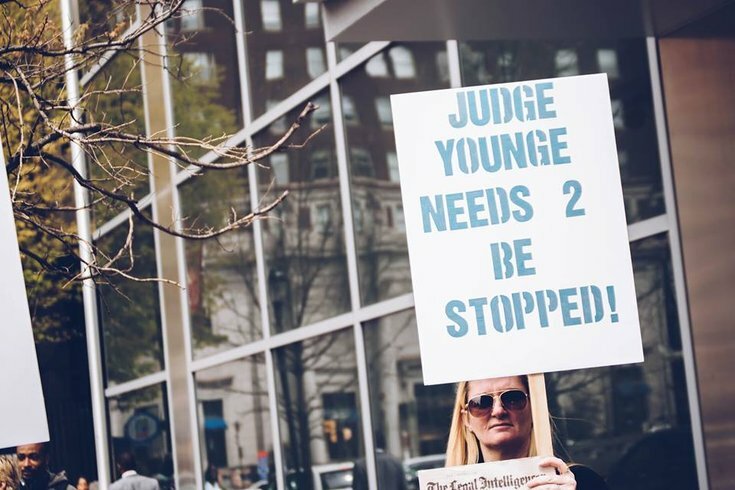 Later in May, Younge would be “absent” from the bench – whether it was because she was “catching up on an administrative backlog,” on vacation or sidelined remains unclear – and another judge brought in to address her cases would arrive. That judge would immediately start overturning many of her decisions, thus reuniting families that had been torn apart. With Younge officially transferred from the Family Court bench, families are more willing to talk freely about what they experienced as they push for the judge to be removed from office entirely. 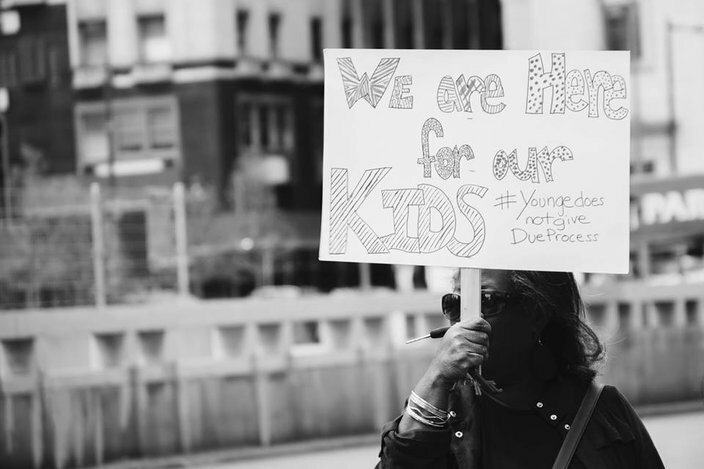 “Hundreds of families have been affected due to Younge’s unsupported decisions. … Lyris Younge has made it her goal to separate families, terminate parental rights, and adopt their children out,” contends the petition, which cites several quotes critical of Younge from Superior Court judges who have overturned her decisions in the past. The petition was started last month by Lisa Mothee, an Olney woman who was in the system attempting to regain custody of five children ranging in age from 10 months to nine years old. When she went to Family Court last September, she was confident that the evidence she brought with her would help get the case closed. According to Mothee, the case started when she took a single Percocet in the last days of her most-recent pregnancy and the baby tested positive for opiates. The hospital called the Department of Human Services (DHS), and her family’s nightmare began. She brought medical records for herself and her children to court that day to prove she was in compliance. The second? When she spoke after Younge told her not to “blurt out in court,” she was taken into custody, and her four older children were picked up from the babysitter and taken into protective custody. Mothee planned to speak out publicly, but was warned not to out of fear for retaliation. She should just be happy that her children were placed with relatives, Mothee was told. That wasn't always the case. Over the past six months, Younge’s behavior on the bench has become Mothee’s obsession. The mother estimates that she's connected with 30 different families who make similar claims. She found them by going to Family Court or drug-and-alcohol and parenting classes and asking around. She also reached out to the Intelligencer, which she urged to get the court transcripts from these cases. Still, the fear of retribution left many of those parents unwilling to speak publicly. That’s when Miltreda Kress said enough is enough. Her case, which began last year, started when DHS came to the house with the mindset that her boyfriend was abusive both to her and her girls. To mother and daughters, the case worker’s accusations were unfounded. Last October, they planned to state that for the record in court, but weren't afforded the opportunity. "She made her decision before the trial ever happened,” Kress said. To Kress, the caseworker – who no longer works for DHS – bears a lot of responsibility for what’s happened to her family. To this day, her daughters are still not living at home. One was put in kinship care with her 42-year-old brother, who Kress claimed wasn't fit for that responsibility. Kress said that when her boyfriend said “they’re my kids,” the child advocates took umbrage. When the case went to court, the children were not permitted to testify. 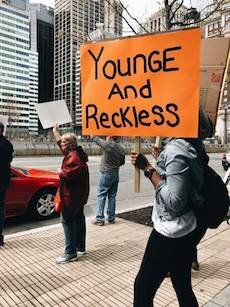 Dozens of parents protested outside Family Court in an effort to draw attention to the courtroom practices of Judge Lyris Younge. Fast forward to February. Kress was fearful that she’d never regain full custody of her children amid the specter of retaliation. It was around that time that she met Mothee. None of the other parents were willing to go on the record, so Kress stepped up. “Damned if I do, damned if I don’t. So, I was the first parent to go on the record,” she said. “I was scared to death. I had nightmares that the judge had hitmen out chasing me. I’d wake up in a full-blown panic attack. I couldn’t eat. I couldn’t sleep. I had nightmares about my kids getting murdered. I quit my job. In late May, the judge who’s filling in for Younge in Family Court reversed the previous judge’s decision and reunited Mothee with her children. Kress will have to wait a little longer. She, too, has appeared before Judge Joseph Fernandes, who took her daughters into chambers to get a feel for a case about which he was just getting up to speed. “My kids told him that they never said the things people said they said. He lifted the stay away order and we have unsupervised visits now,” said Kress, noting that Fernandes didn’t instantly overturn the previous decision. Instead, he said he wanted Kress to finish the women’s-empowerment classes and therapy before making that final decision. “If she does that, I don’t see a problem with you going home,” the daughters were told. Kress is unhappy that Younge merely got transferred and not removed from the bench entirely. “Honestly, I don’t feel like she should be allowed in any court,” she said. “She’s not fair. She’s not impartial. She should be facing criminal charges or disbarred. She stole people’s children away without a fair trial." Removing a judge elected to the bench is not an easy proposition in Pennsylvania. Judges can either be impeached by the state House of Representatives and then convicted with a two-thirds vote of the state Senate, or the judicial conduct board presents its case to the court of judicial discipline, which can impose sanctions ranging from reprimand to removal from office. Kress doesn't seem to be willing to let up with Younge or the system itself. For James Binns, the local attorney whose been in touch with these families because his daughter's case was heard before Younge, it's a relief to see "Fernandes starting to undo everything she's done." Meanwhile, Mothee remains concerned about the long-term impact the situation may have on her children. “It was pretty traumatic for them. They’ve never been anywhere else but with mommy and daddy,” Mothee said. “Even now, my three-year-old tells me when she wakes up that she misses me. “It’s hard for them. I can’t explain it to them. It’s a secret that nobody wants to think about. They think if people get their children taken away, that they must have done something wrong.